The state's top three leaders bet everything on public education and property taxes this year, but they can't get where they're going — especially if they want to cut property taxes — without bringing some Democrats to their side. The 2018 election sure made a hash of partisan politics in Texas. You have a state government dominated by Republicans pushing for across-the-board teacher pay raises, higher spending on public education — without vouchers — and now, a 16% increase in what is already the 12th-highest sales tax in the U.S.
Texas legislative leaders are trying to find a sweet spot between Democrats who seem almost genetically opposed to raising sales taxes and Republicans who would rather reduce property taxes without increasing another tax to pay for it. On paper, at least, they’d prefer spending cuts — the reliable “fraud, waste and abuse” ploy. It leaves the leaders — Gov. Greg Abbott, Lt. Gov. 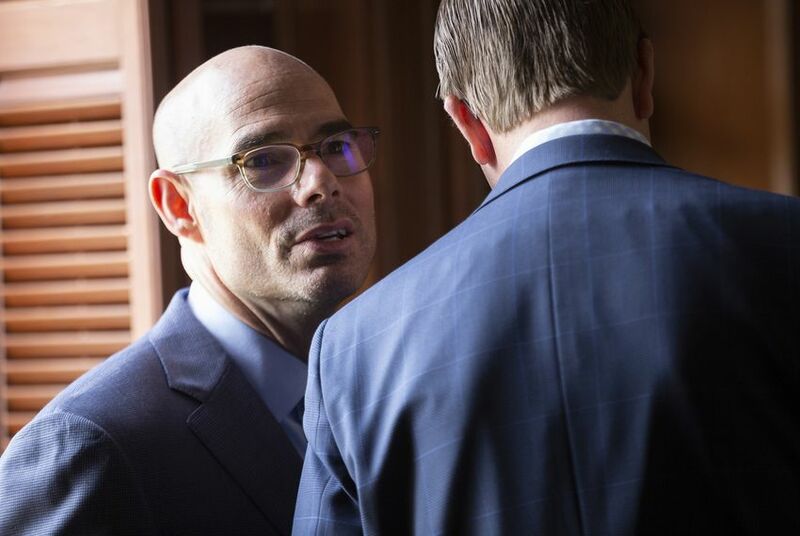 Dan Patrick and House Speaker Dennis Bonnen — with a difficult needle to thread. They’ve endorsed a sales-tax-for-property-tax swap that would raise the sales tax by a penny, to 7.25 percent, and use the roughly $5 billion that would bring in to buy down school property taxes. It takes 100 votes in the House and 21 in the Senate to put something like that on the ballot for voters — the current plan — and that requires, in turn, a bipartisan vote. There are only 83 Republicans in the House and only 19 in the Senate. Even if they were all to stick together, they wouldn’t succeed without crossovers from the other party. That leaves the leadership tinkering to find a balance between those conservatives who want all of a tax increase, if there must be one, to go to property tax relief, and Democrats, some of whom might be able to swallow a sales tax increase if the money goes into public education spending. They’re testing ideas, like state Rep. Dan Huberty’s proposal to use 80 percent of the proceeds for property tax cuts and 20 percent for education. Does that attract Democratic votes faster than it loses Republican ones? Is there a balance that ends with at least 100 votes in favor of Huberty’s proposed constitutional amendment? The Senate math is easier — they only need two Democrats if they can hold onto every Republican — but the balancing act is similar. To make a swap work, they’ll need to attract Democrats without losing too many Republicans. Raising more money for public education is more popular with Democrats than Republicans, according to the most recent University of Texas/Texas Tribune Poll. Cutting property taxes is more popular with Republicans than Democrats. There’s a balancing act there, too, with the leaders trying to rebalance public education funding, to spend more money on schools – either through raising teacher pay or boosting school budgets more broadly – to limit future increases in property taxes and — if they can find a way to pay for it — to cut property taxes. Some of what the Republican leaders are selling is attractive to the Democrats — perhaps more attractive than it is to some of the state’s most conservative voters. Patrick has been pushing for teacher pay raises since before the elections; it’s a way to push public education money directly into classroom spending and it could blunt criticism of him in the education community. That opposition was in high relief last year, first when Republican education advocate Scott Milder challenged him in the GOP primary, then when Democrat Mike Collier came within 5 percentage points in the general election after a campaign with an emphasis on education and property tax appraisal reform. Patrick is hardly alone in this. Abbott won with relative ease last year and Bonnen, who wasn’t opposed in the general election, won his first race for speaker with a fast and stealthy campaign right after the general election. But Republicans lost races in the House and Senate they didn’t expect to lose, and many came into the current legislative session looking for wins on issues important to voters — like public education and property taxes. This week’s debates over reining in property tax bills — attempts to require voter approval for property tax increases over 2.5 percent — are one part of the leadership package, and the first real peek into leaders’ ability to succeed with their grand deal on schools and property taxes. Talk of failure is already in the air, in the form of speculation about whether it will take a special legislative session if things don’t come together in the regular session. But waiting won’t improve their chances. This session’s fuzzy party lines, with Republicans open to education spending and Democrats open to property tax cuts, might help. And property taxes might be the acid test: If the leadership’s scheme hinges on those cuts, they’ll need supermajorities — 100 in the House, 21 in the Senate — to pass a constitutional amendment. That’s not any easier in a special session than it is right now.